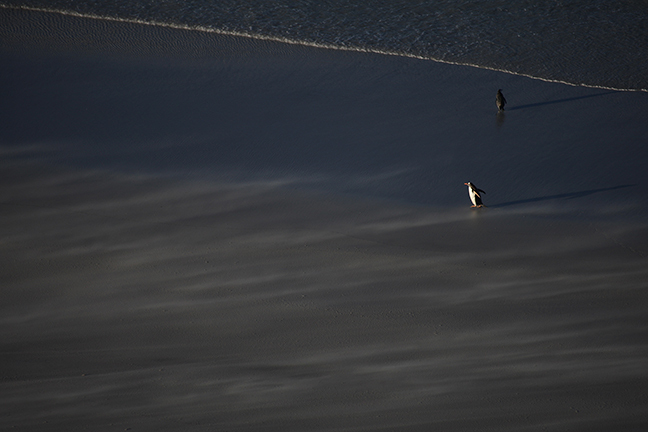 Three hundred and eleven miles east of the southern coast of Argentina lay the 4,700 square mile British Overseas Territory known as the Falkland Islands archipelago, home to 2,928 resident islanders, most of who identify as “Falkland Islanders.” They share the 778 islands with more than a million penguins and half a million sheep. Less than a dozen of the islands accommodate overnight tourism and most of these are privately owned. Some have been owned by the same families for generations and one, Pebble Island, is currently for sale for the first time since Merchant John Markham Dean bought it from the British government in 1869. 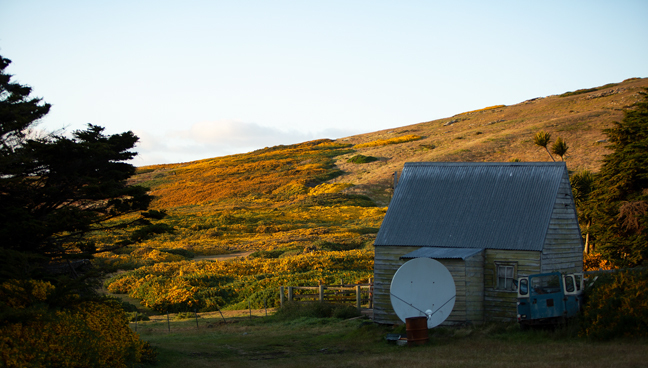 Accommodations range from small modern lodges with chefs to self-catering refurbished military portakabins. There’s never a crowd, no lines and no opening and closing times. There are set meal times at the lodges, but in late December, sunrise is around 4:45 a.m. and sunset is around 9:20 p.m., so meals rarely overlap with golden hour light. You’ll be walking on, sitting in and a constant target for guano droppings, so a washable hooded windbreaker and rain pants are the best protection. Since it’s always windy, it makes sense anyway. The weather can be sunny one minute, followed by a squall of horizontal rain the next and that assumes you arrived on schedule and your flight from Punta Arenas wasn’t cancelled. Ours was, so we lost a day on the islands. Five species of penguins, King, Rockhopper, Gentoo, Magellanic and Macaroni, breed in the islands and are the main attraction, unless you are a sheep shearer. 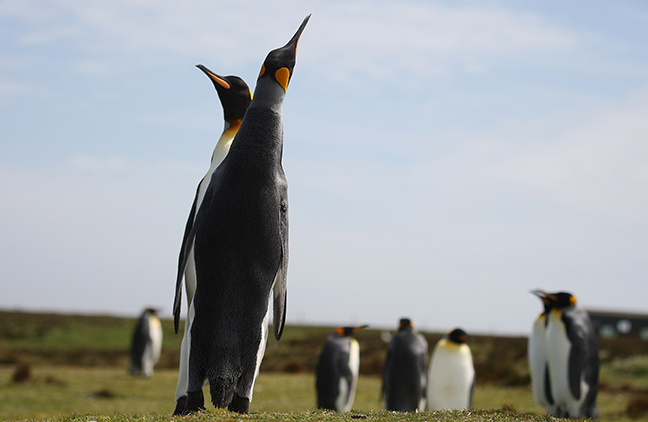 Volunteer Point on the east coast of East Falkland Island is the largest breeding group of King Penguins within the Falkland Islands, where they are at the northerly limit of their range. There are about 150 breeding pairs in the colony. They are the second largest species of penguin, second only to the Emperor Penguin. 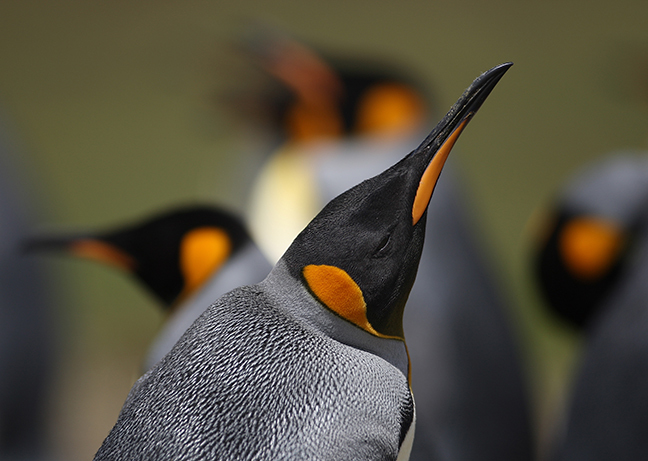 King Penguins are serially monogamous. 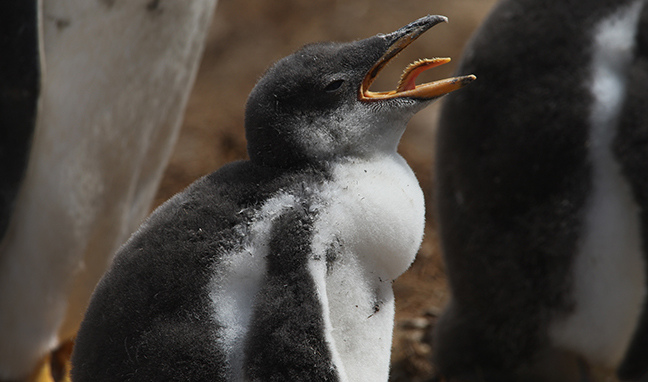 They feed their chicks by partially digesting fish and then vomiting the food into their chick’s mouth. 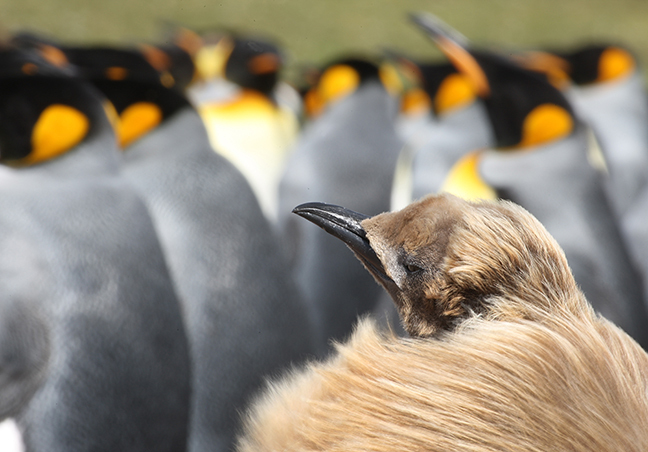 King Penguins can form huge breeding colonies, in some places numbering over 100,000 pairs. 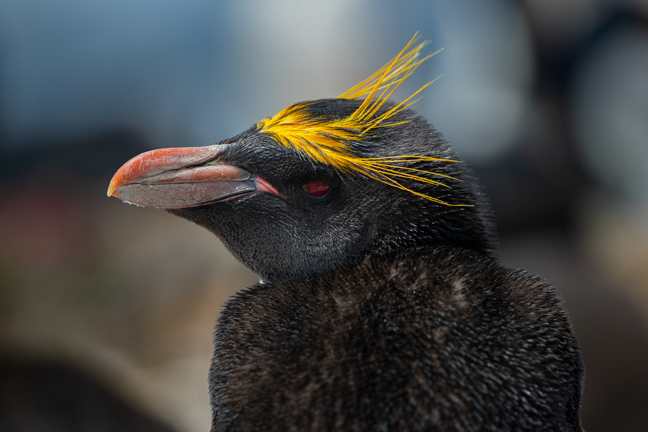 Climate change is predicted to have a massive effect on the non-migratory King Penguins as warming ocean temperatures will push preferred seafood stocks further away from existing breeding colonies. Up to 70 percent of the world’s population will either have to find new places to live or will die by the end of the century. 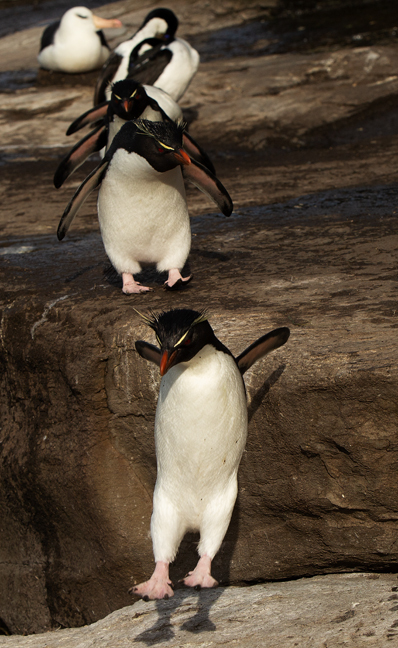 The Southern Rockhopper Penguin is the smallest Falkland penguin with adults weighing 5-6 pounds. They are migratory, arriving in the islands to breed in early October and leaving by the end of April. 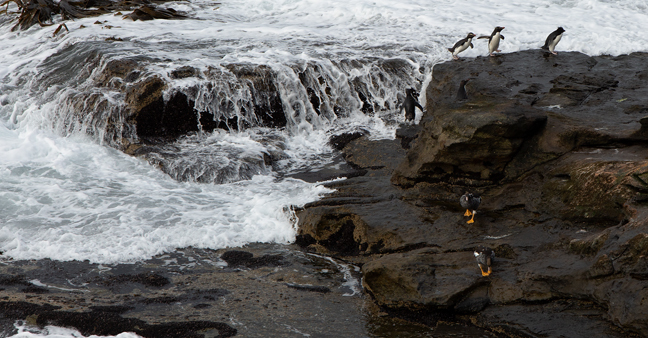 Rockhoppers bound—rather than waddle, as most other penguins do—along the craggy, shorelines of the islands. Their population has declined by about one-third since 1990, most likely due to over-fishing by commercial fleets. 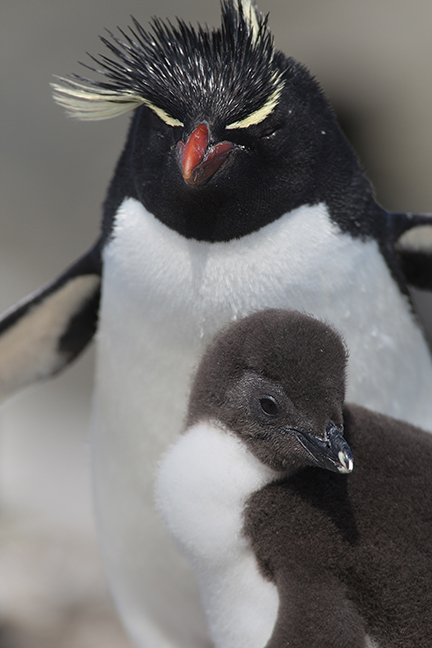 More than half of the world’s population of Rockhoppers breed in the Falkland Islands. 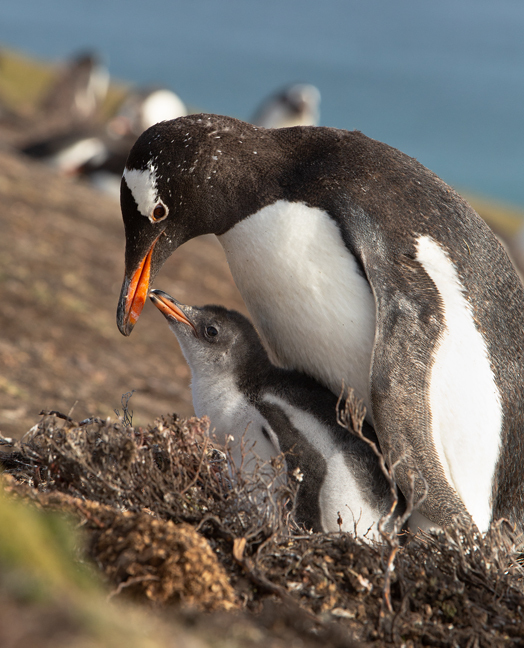 The Falkland Islands regularly host the largest breeding population of Gentoo Penguins in the world, averaging more than 100,000 pairs. 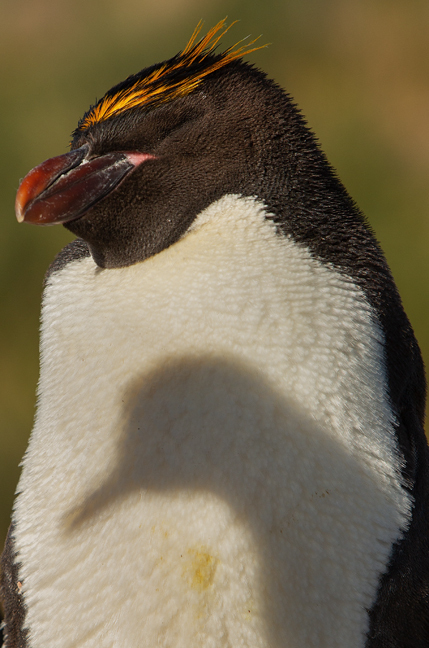 They are the second largest Falkland penguin, standing about 30 inches tall. 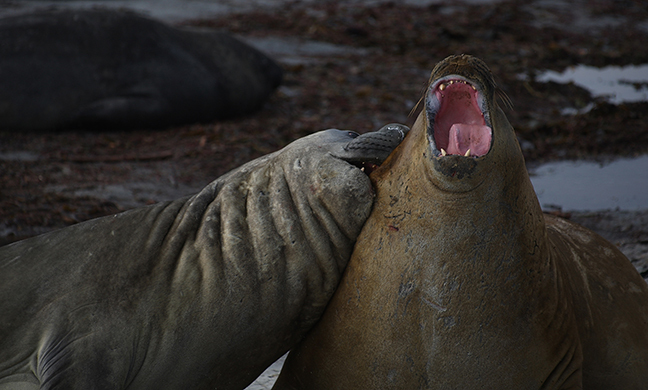 Sea lions are the main predator of adult birds, while Skuas and Striated Caracaras take eggs and chicks. 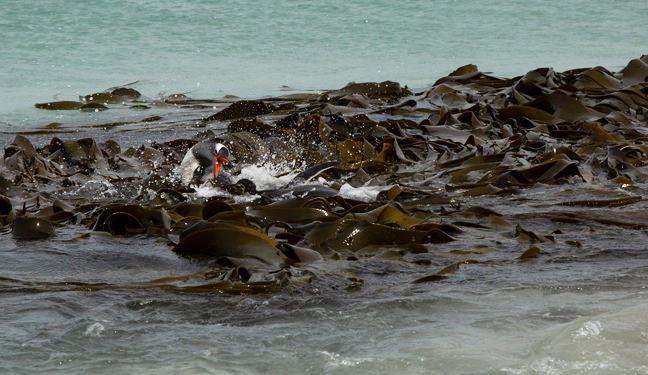 They are inshore foragers and rarely venture more than 12 miles from shore. 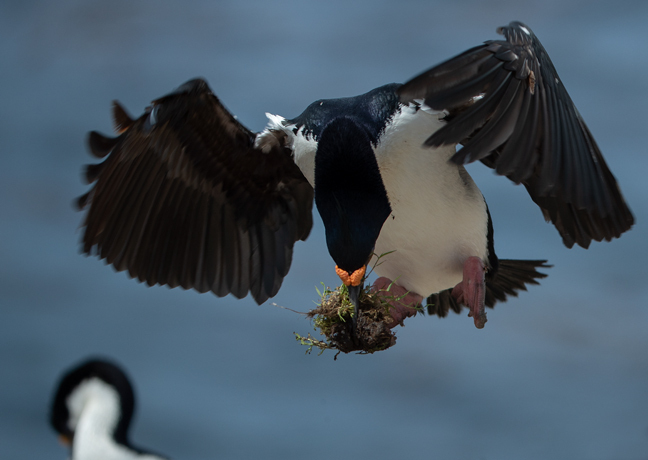 When raising chicks, they leave their nests at first light and don’t return until early evening. 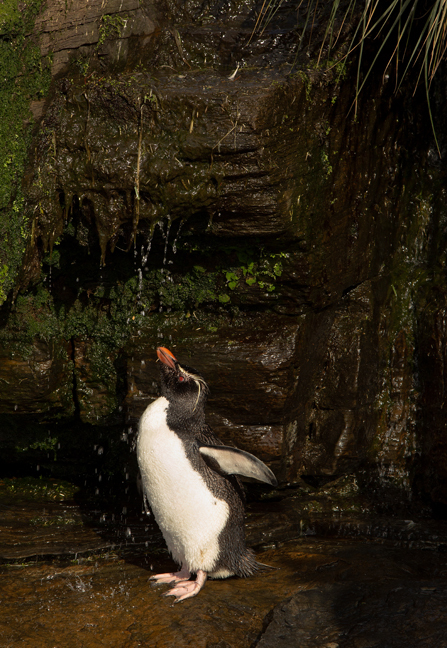 They are the fastest underwater swimmers of all penguins, with measured speeds of up to 22 miles per hour. After about 30 days in the nest, the chicks join other chicks in the colony to form créches; groups of unrelated young cared for by one female. Magellanic Penguins are only found in South America and the Falkland Islands where there are more than 100,000 breeding pairs. 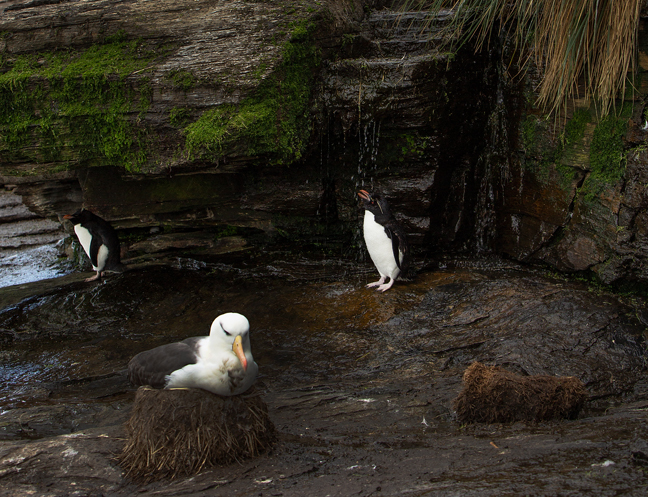 The generally nest in burrows spaced much further apart than surface-nesting penguins. 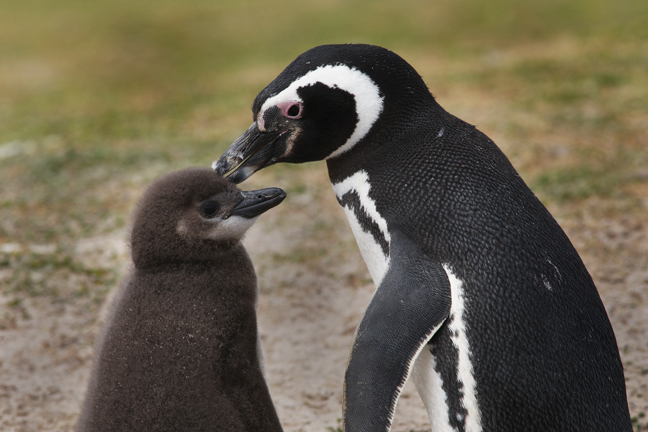 The burrows provide protection from both cold weather and predators so Magellanic Penguins do not form crèches. Populations declined severely beginning in the 1980’s with the rise of commercial squid and finfish fishing in the region. They are also highly susceptible to oil pollution, which is increasing in the region, and suffer from the loss of protective Tussock grass due to overgrazing. 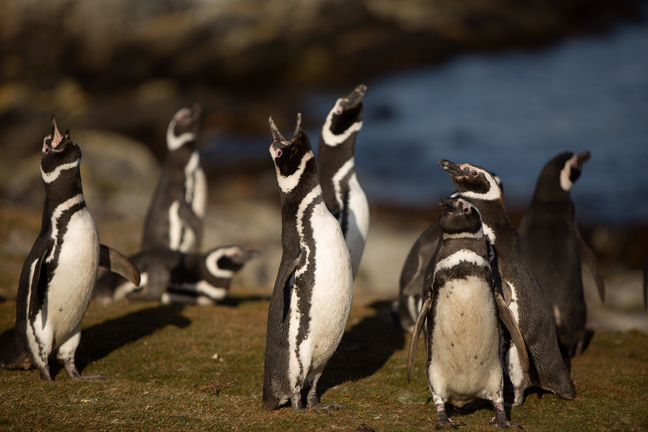 Breeding male Magellanic Penguins often stretch skyward and emit a loud call to attract females. 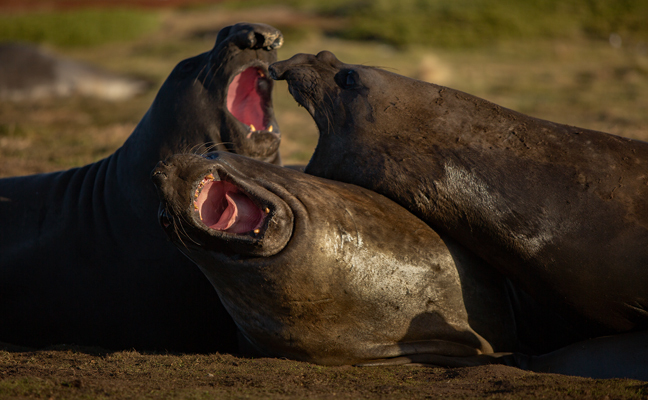 Once paired, both males and females will demonstrate this “ecstatic” display simultaneously. They are monogamous; returning to the same mating partner every year and the female is able to find her mate through his call. 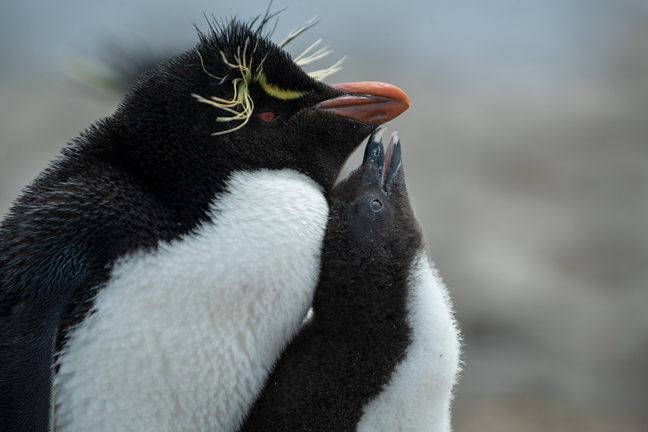 Although the Macaroni Penguin is the most numerous of all the world’s penguins, it is the rarest of the breeding penguins in the Falkland Islands. 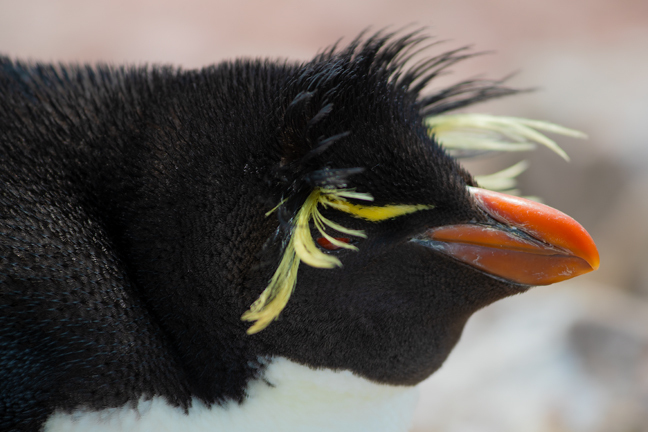 There are no Macaroni Penguin colonies in the Falklands. 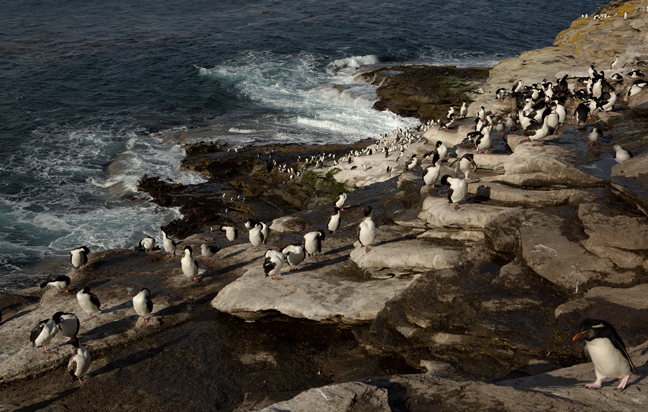 About 50 pair breed in Rockhopper colonies throughout the islands. 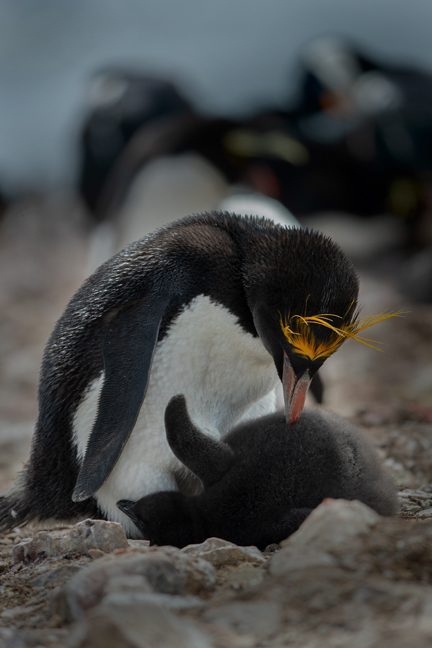 After hatching, the male broods the chick for the first 24 days while the female leaves the colony after daybreak and returns with food later each day. 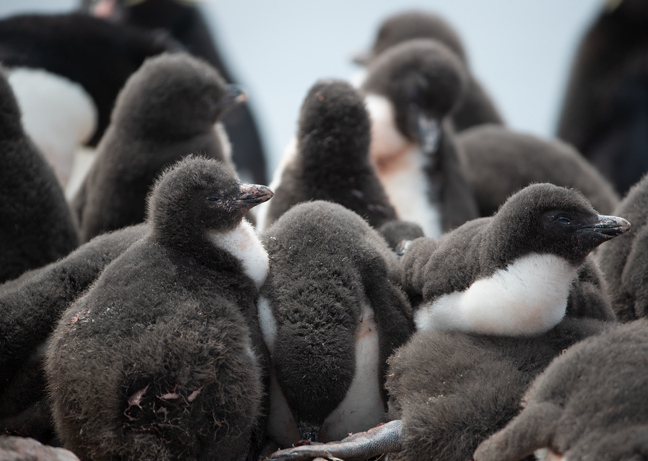 After 24 days the chicks are able to maintain their own body temperature away from the nest and gather into crèches while both parent forage at sea. 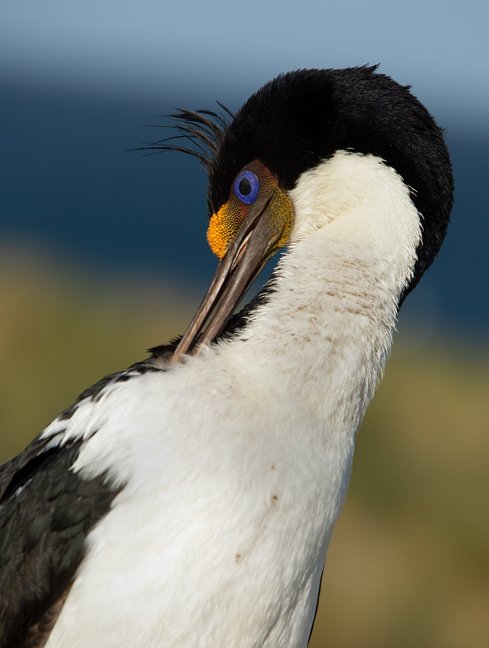 The Imperial Shag, also known as the Blue-eyed or Imperial Cormorant, breeds in large colonies along the coast throughout the islands. They forage during daylight hours and can dive to depths of 200 ft. 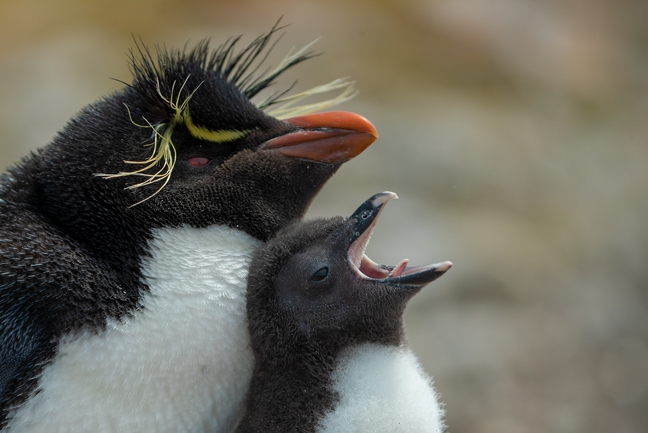 They are monogamous and often nest in mixed colonies with Rockhopper Penguins and Black-browed Albatrosses. 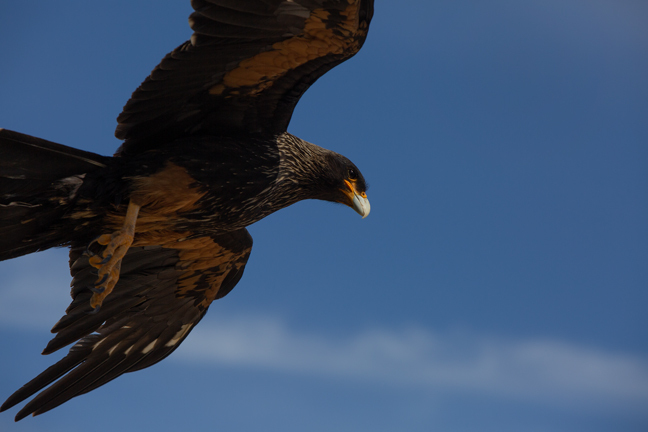 Unlike cormorants of temperate zones, they do not dry their wings by spreading them after diving. 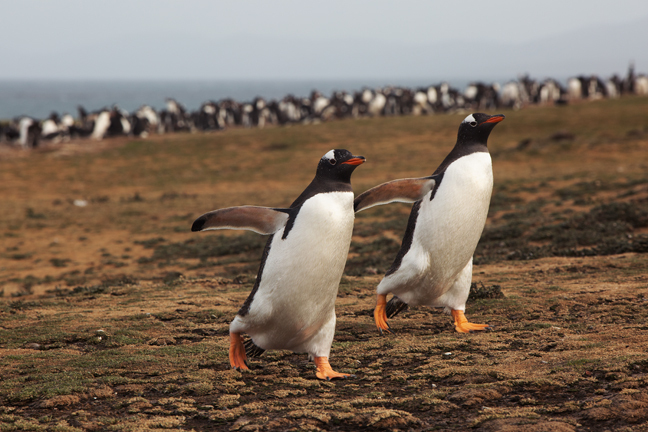 The Falklands’ population is non-migratory and number about 60,000 breeding pairs. 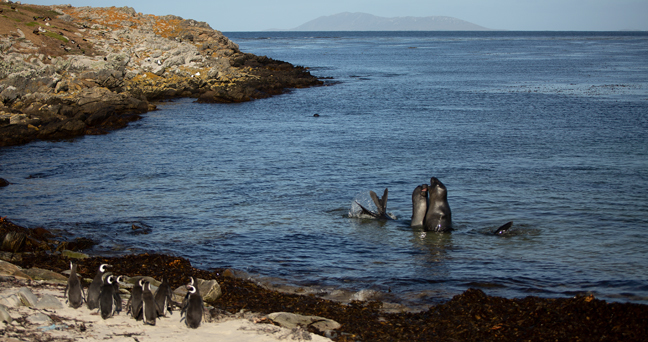 Penguins and cormorants encounter a number of predators at sea such as sea lions, leopard seals and orcas. 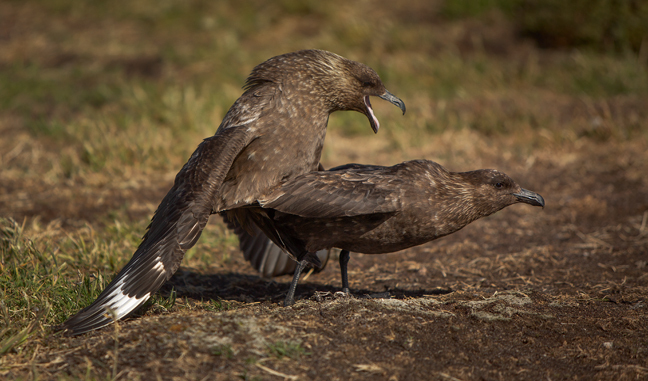 They also face predation of chicks and eggs by avian predators such as caracaras, gulls and skuas. 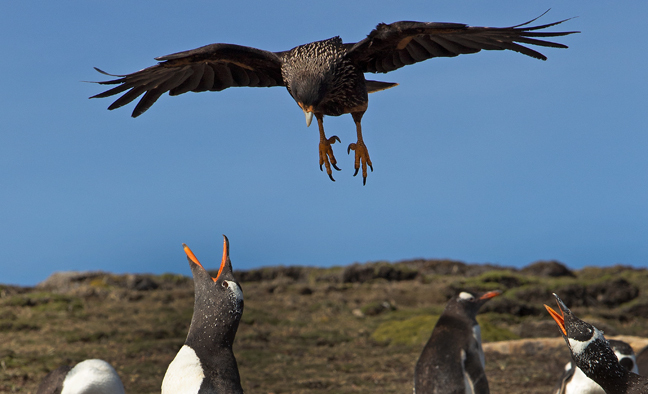 The Striated Caracara, known as the Johnny Rook in the Falklands, also attacks newborn lambs. 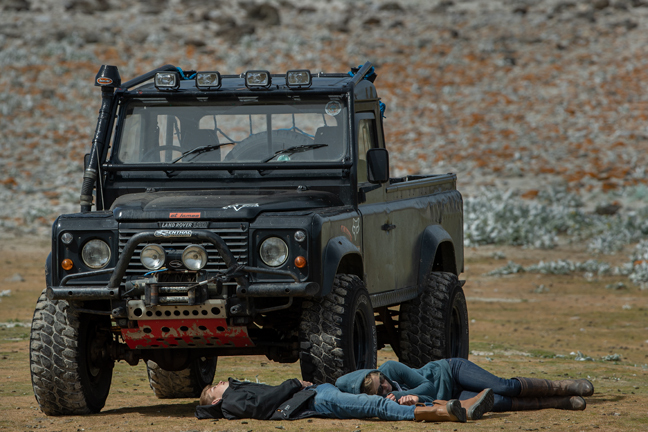 Farmers decimated its population and only 500 breeding pairs are now found throughout the Falklands. 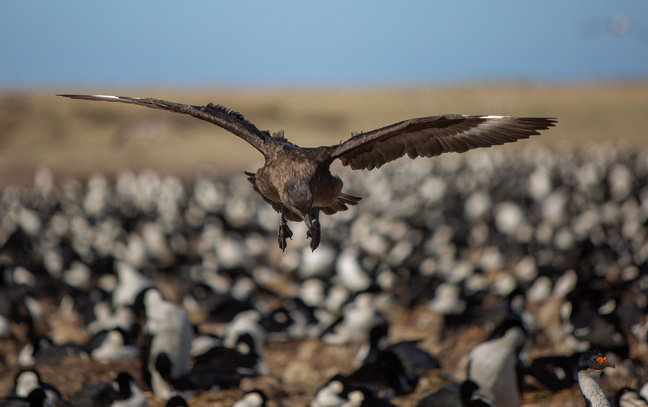 Skuas nest on the outskirts of penguin and cormorant colonies from which it steals eggs and young. 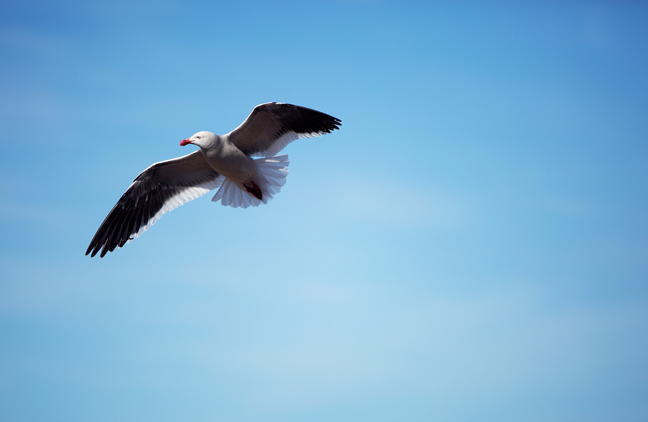 They aggressively protect their territories and will often dive bomb people walking too close. 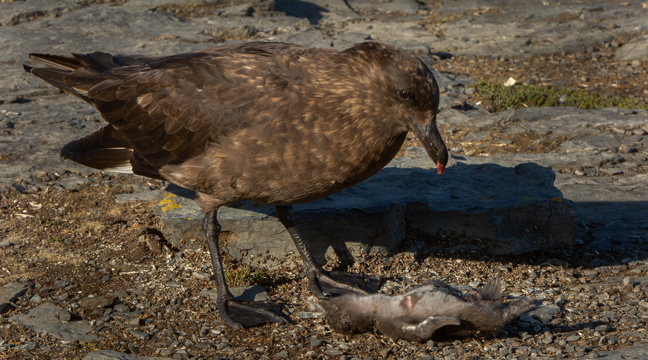 Dolphin Gulls also harass penguin and cormorant colonies and feed on eggs, nestlings and carrion. 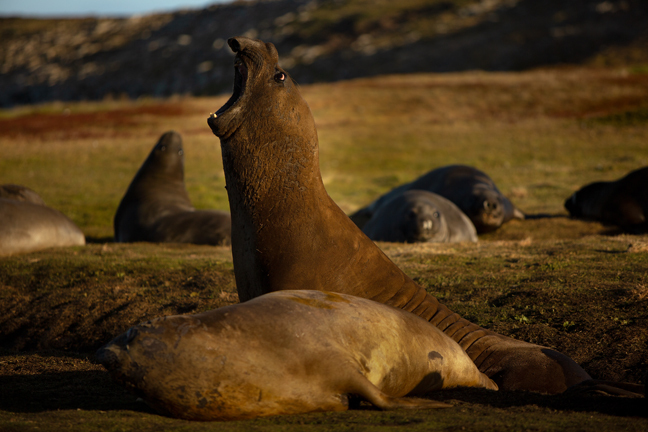 Elephant Seals spend up to 80 percent of their lives at sea and can hold their breath for more than 80 minutes, longer than any other non-cetacean mammal. They are almost entirely aquatic, coming ashore primarily to breed. The males arrive at rookery sites in early December and remain throughout the breeding season without going back to sea to feed. 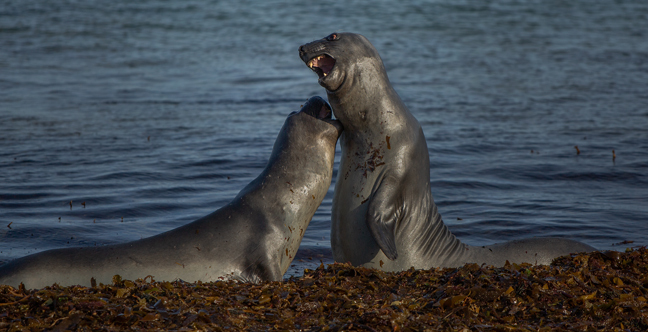 They move slowly on land and therefore cannot defend large territories or a large number of females. Unlike other seals, which may have harems averaging 40 cows, a dominant bull may have only a dozen cows within his territory. 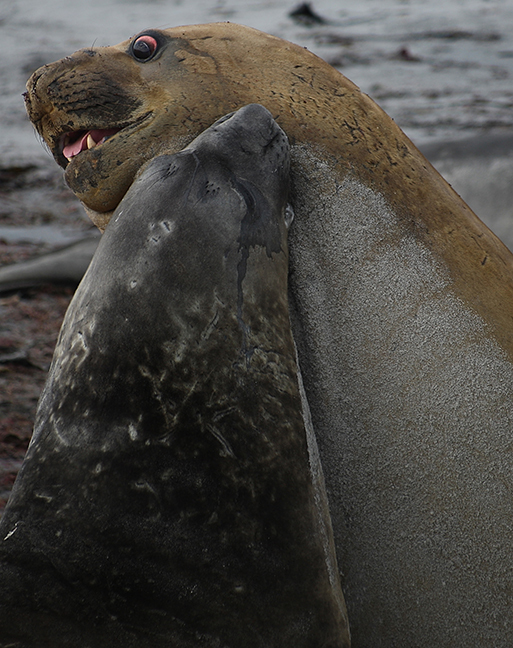 Elephant Seal populations have crashed in the Falklands, with most of their previous breeding sites now lying deserted. The Falklands population now stands at less than 700 breeding females, a 90 percent decline since 1982, most likely due to climate change. Carcass Island has been a working sheep farm for more than a century. It is owned by R.P. McGill. The island's three heritage-listed buildings are a boathouse, a shed and a store. The island is owned by the Pole-Evans family who graze more than 6,000 sheep on their 51 square miles. Our guide Amy and her 14-year-old brother, James, who was home for the holidays from boarding school in Edinburgh, Scotland, nap under his jeep while I photograph penguins. We rode in Amy's jeep (not pictured) to the various penguin colonies located on their 65,000 acre family farm that borders Seal Bay.